Press Quick Info to turn on large thumbnail viewers for buttons and items in the Alpha, Material, Texture and Tool palettes. Delay sets the time (in seconds) before the large thumbnail viewer pops up. The Tolerance slider controls how many pixels the cursor must move before the pop-up menus close. The Preview Icon Size slider increases or decreases the size of the thumbnails. 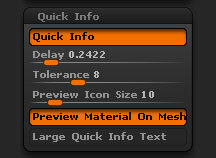 Preview Material On Mesh allows you to preview the effects of a material on your mesh by moving the cursor over materials in the material pop-up. Large Quick Info Text sets a larger font size in the pop-up help.